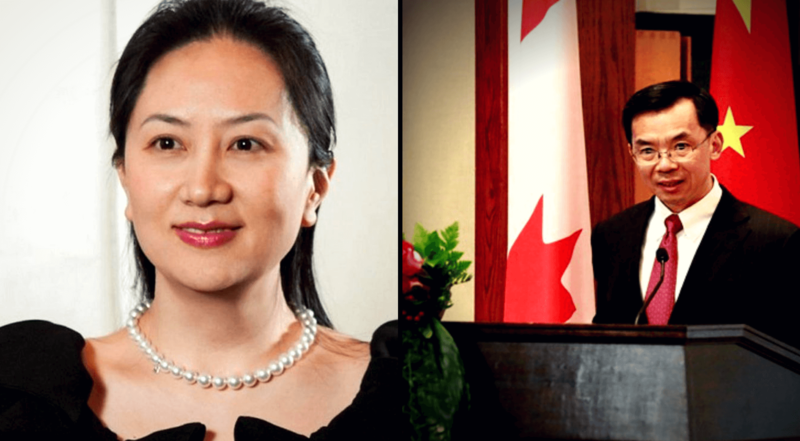 Beijing’s aggressive behaviour towards Canada following Meng Wanzhou’s arrest has irreparably damaged China’s reputation in Canada, writes Charles Burton. The arrest of Huawei CFO Meng Wanzhou at the Vancouver Airport on December 1 has been followed by a series of mutual recriminations between Canada and China. This has led to a shift in the Canadian public opinion from general skepticism about the intentions of the People's Republic of China (PRC) regime to overwhelming hostility toward it. The upshot is that this has put the brakes on the Trudeau government’s engagement of China. The government had sought to enhance Canada's access to the Chinese market, thereby allowing for diversification of Canada's economy away from its high degree of dependence on Donald Trump's United States. In exchange, Beijing had hoped to remove restrictions of Chinese state investment in Canadian natural resources, restrictions of Chinese state acquisition of Canadian high-tech firms, and an extradition treaty which would allow China to demand the return of PRC nationals who had fled to Canada after falling afoul of China's Communist authorities. None of these concessions to China would be politically possible now, especially with a general election coming up. Indeed, there is no prospect of rebuilding trust and reconciliation between Canada and China's current regime under President Xi Jinping. And assuaging well-based concerns over the security risk to Canada of Huawei 5G technology is now completely off the table. A warrant for Ms. Meng's arrest had been issued by the United States in August of last year, so her presence in Vancouver was unexpected in the sense that one would have thought that whoever was authorizing her foreign travel plans would have consulted the list of countries that have extradition treaties with the United States and sent her elsewhere. Nevertheless, the audacious fervor with which the Chinese regime has sought to pressure the Canadian Prime Minister to intervene in a judicial process and order the immediate return of Ms. Meng to Beijing does prompt a few questions. First of all, why is Beijing prepared to essentially burn down all its diplomatic relations with Canada in a fruitless attempt to force the return of this single Chinese national? After all, the arbitrary arrest of Michael Kovrig for prolonged brutal interrogation in a "black jail" by agents of the Ministry of State Security is an outrage, especially given China’s evident gross violation of the 1961 Vienna Convention on Diplomatic Relations by attempting to induce Mr. Kovrig to reveal under duress classified information from his previous capacity as a diplomat employed in the Political Section of the Canadian embassy to China. The arrest of Michael Spavor is harder to parse. Mr. Spavor, a fluent Korean speaker, is one of the very few foreigners who has established a degree of rapport with the North Korean dictator, Kim Jong-un. Does the PRC regime perceive some sort of Canadian-coordinated deep conspiracy to draw Pyongyang away from China's orbit coordinated by Mr. Spavor? We will all have to wait for Mr. Spavor's forced false confession to be broadcast on Chinese television to know for sure. Of course, the prospect of Robert Schellenberg being executed should be seen for what it is - a device for Beijing to express displeasure with the Canadian government’s lack of compliance when it comes to China’s demands for Ms. Meng’s release. That fact is utterly repugnant to all decent-minded people. In the meantime, the China’s ambassador’s disastrous attempts at public diplomacy – from his ridiculous assertion that the Canadian government arrested Ms. Meng for reasons of “white supremacy” (an assertion well outside the bounds of acceptable diplomatic discourse) to his extraordinary meeting with Canadian journalists at the Embassy where Lu Shaye came off both thuggish and pathetic when he threatened retaliation if Huawei was banned – makes one wonder if he is being humiliated on order from Beijing or if the consequences to himself and his career if he fails to bring Meng back to China are the reasons for his increasingly panicky demeanour. Notably, the Chinese government has now even distanced itself from its own ambassador, with the PRC regime saying that they have no plans to retaliate if Ottawa ultimately bans Huawei from being involved in the 5G network for Canada. It is remarkable that China does not understand that their intimidating tactics and death threat diplomacy have the opposite effect to what is intended. The more the Chinese Foreign Ministry spokesperson attempts to diminish Canada’s rallying of our allies to denounce China’s appalling responses to the Meng arrest, the more encouraged we are that this tactic is working in our favour. That no country has taken the Chinese side is very telling. Meng Wanzhou is likely to be the successor to her father as CEO of Huawei, the world’s largest manufacturer of telecommunications equipment - and touted by Beijing as a “national champion” enterprise. She is therefore a member of China’s Communist Party super-élite. Is the Chinese government’s extreme determination to get her safely home about defending the class privilege of Meng Wanzhou herself? Or is it more about Huawei as a company? The bottom line is that Ms. Meng could face a lifetime in prison if she is extradited to the United States to face multiple serious charges of fraud, each of which carries a sentence of up to 30 years. Under such circumstances, despite the fact that she has family in China, would Ms. Meng seek leniency by providing the US government with information about Huawei's relationship with China's security and intelligence apparatus? Ultimately, the Chinese ambassador’s threats of dire consequences if Canada follows through on the extradition of Ms. Meng ring hollow. Whether her lawyers are able to successfully argue that she is not eligible for extradition to the US under Canadian law or whether she ends up in court in New York, this unprecedented crisis in Canada-China relations can only be healed once Meng Wanzhou is no longer on Canadian soil. This may be a very long time off. However it turns out, irreparable damage to China’s reputation in Canada has been done. Any naive assumptions Canadians may have had about the prospects of the Chinese Communist Party coming into compliance with international norms in the years ahead have been thoroughly dashed by the severe mistreatment of Kovrig, Spavor and Schellenberg. China’s future ability to co-opt Canadian policy-makers to support its interests in our country have been seriously debased. Future Canadian engagement with China will be guided by pragmatic calculation alone. Charles Burton is an associate professor of political science at Brock University in St. Catharines, and a former Counsellor at the Canadian Embassy in Beijing.